Simply put, I chose to begin a career in real estate at the worst time in a tough market, knowing that so many agents display a general lack of competency and follow-through. This prompted me to pursue a commitment to consistent communication and delivering on my promises. If you’ve ever had the misfortune of working with a less-than-professional realtor, I hope you will allow me the privilege of earning your trust and ensuring your complete satisfaction. My start in real estate came during the summer of 2010. Just think back for a second to the state of the economy and industry at that time. Short sales in Phoenix were wildly abundant, foreclosures littered the streets, getting a loan was quite a challenge and refinancing or modifying your mortgage was virtually impossible. Does that ring any bells? Who in their right mind would sell their other business and jump into real estate full time during the middle of an absolute crisis? I did because I’m a bit of a contrarian – something I learned as an investment advisor from 1998-2003. I used to work for a boutique brokerage firm in Montreal, Quebec (yes, I’m Canadian and I do speak French!) where I enjoyed helping clients grow their hard-earned savings. Do you remember day trading and the dot com bubble? I was in the middle of it but when things didn’t improve after the 2001 meltdown, I sold my investment book of business and launched an online marketing company after moving to Phoenix in 2004. I was fortunate to be in the right place at the right time, before blogs were popular, Google was still an infant and nobody really knew what search engine optimization was. As this industry naturally matured and competition grew more fierce, I chose to leave the online world in 2009 and turned to real estate, where I knew I could make a difference by helping Phoenix homeowners. Remember, this was at a time when doom and gloom dominated the headlines and Realtors were leaving the industry in large numbers. So why did I become a real estate agent? Looking back on my days as investment advisor, I realized that my passion is helping people, whether trading investments, finding something online or selling a home. One of my greatest flaws may be trying to help too many people all the time. Real estate is an incredibly stressful field and anyone who has bought or sold a house knows exactly what I’m talking about! There is a huge amount of details to oversee and cooperation required between lots of different parties that must take place for a successful closing. I once saw a list that included almost 200 steps in the entire process to complete a real estate transaction. That is a big time commitment, so you want to be sure you’re working side by side someone who truly loves what they do. Because I understand the importance that little things plays in real estate, I remain very detail-oriented and along with my transaction coordinator, we ensure nothing gets overlooked, no matter how trivial it may seem to the overall process (think mailbox key or garage remote). We know that buying or selling a property is often a big source of stress and my job is to take that entire burden off your shoulders. Go ahead, let me take on all the worry for you, look out only for your best interests, keep you updated each week and walk you toward a successful closing! There is no doubt that being an experienced and dedicated Realtor is a truly demanding career, filled with intense listening, sincere caring and placing your interests above all else. But when I’m not working for my clients (which isn’t very often! 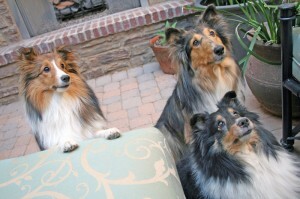 LOL) I enjoy playing with my 3 dogs – all Sheltie girls – and working around the house to keep it looking sharp. I like golf and exercising, but also love to eat and try new things. Enough about me… what about yourself? What will I learn about you as we work together to reach your specific real estate goals? I can’t wait to find out, so let’s get started. Questions? Want to know more about me or my service? I look forward to hearing from anyone with a real estate need in Phoenix so don’t hesitate to reach out for assistance on any matter, large or small. Thanks for reading and enjoy the rest of my site!